Hosur Has Excellent Health Facilities - World famous - Narayana Hrudalaya has a Super speciality Clinics and Diagnostic centre opp. Hosur Traffic police station. Sparsh Trauma care next to Traffic police station and their Main Hospital Multi Super speciality Campus is just 15 min. drive in Bommasandira, Bangalore suburbs on the NH7 Hosur road. Medical shops of more than 50 with door delivery facility are available all around Hosur. Appollo pharmacy, tulsi Pharmacy, Murthy medicals, Star medicals are some of the leading shops. Agarwal eye hospital, Vasan Eye care, SVS Multi speciality , Arogya Hospital (100 Bed), Gunam Multispl hospital (100 Bed) and Chandras sekara Multi speciality (100 bed) on Bagalur road numerous specilaity hospitals are here in the NH7, Dkk road and Tank Street. KMC, Trichy has a proposal of a Multispeciality 150 Bed hospital on the NH7 near Maruthi Nagar opp. Hudco police station. Take your Two wheeler and drive into the congested Hosur town for shopping or Park your car in Paid Car park near Hotel Gowri shankar or near Sub collector office on the end of Tank street and take a walk. Jainsons, Vasanth & co, Sharptronics, Rainbow and many other shops are in Taluk Office road, Selling at a very competitive price for Electronics and Home appliances. Singapore Shoppee for latest Electronic Gadgets. Jewellery like Tanishq Factory showroom, GRT, AVR, Jos Alukkas, Kalyan, Nathella, Chemmanur, Susheel, ARRS Silks, Nalli and Malabar Gold, Jewel One have opened their show room. Almost all brand Two wheeler and Four wheeler Showrooms - KTM, Hyundai, Maruti, Tata, Mahindhra, Cheverlot, Ford, Wolksvagen, Nissan, TVS, Hero Honda, Bajaj, Skoda, Suzuki, Kinetic, Honda, Enfield are in Maruthi Nagar, Krishnagiri road with service centers. Car accessories, spares, tyres are available all over hosur. Branded Shirts and textiles are in MG road, Nethaji road and old Bangalore road. Childrens wear are available in Radhas, Santhosh Lifestyle, Megahertz, Gokuls on MG Road. Raymonds, Planet Fashion, Louis philip, Cotton Street, Bombay dyeing, Binny , Megamart, Basic, Bommis Ramraj Textile showrooms on Nethaji road. Ramraj, Peter England, Unlimited, Planet fashion, Louis Philip showrooms. And Now Leading Chain of Textiles and Jewellery Show room has entered hosur. Chennai Silks1 Lakh sq.ft., with all Family Shopping of Textiles, Accessories, Watches and Sunglasses, Leather accessories and ARRS silks 50K sq.ft. , ARRS Jewellery and Kumaran Thanga Maligai has joined the Band wagon to fix Hosur in the Business Map with a Huge Shopping Complex. Silk Sarees at Chennai Silks, ARRS Silks, Radhas, Devis, Gokuls, Pachiamman silks, Kumar textiles., Concept house in Maruthi Greenfields. Exclusive Cell phone showrooms of leading brands like Nokia, Airtel, Reliance, Samsung, Vodafone, Aircel, Bsnl, Univercell, Purvika, Apple Iphone -Singapore Plaza & other leading Chain stores are spread all over hosur. Opticals are in Old Bangalore road and Tank street . Good quality frames and lenses are available and competetive than Bangalore. Also at Vasan Eye care, Lenskart, Agarwal, Titan Eye + Opticals at Titan Factory. Stationery - Ganesh paper mart, Vignesh paper mart on Nethaji road, Sri Ram near Busstand are excellent shops. Colour Xerox - Sri Nidhi on Taluk office road, Mani Xerox opp. Gokuls, Meenoo color prints are the Best. Nilgiris Bakery, Qbake - german bakery products opp. Raghavendra theatre, Kanniah Bakery , Sarathi bakery are some of the leading Bakers in Hosur. BIG BAZAAR, Nilgiris, Pallavi Fresh, Amrutha Inn, Pappa Johnes pizza corner in Rayakottah road, Dominos NH7, Wrap House opp. RC Church, Dkk road , KG Chicken opp. Yesodha mahal, , Five Star Chicken on Bagalur road, Meat n Eat near RC Church and Bagalur road are some of the Food Joints catering evening Juice, Chat , Corn and Pizza, Burger, chicken. Lodging – Opening Shortly Radisson Resorts Hosur near TAAL, Renaissance Grand Sarovar Portico - 4 star category on krishnagiri road . Shivaranjani, Gowrishankar, Renaissance in Busstand, Yesodha towers, Dhanunjayas , Pepper Mint, Chennies Classic are the decent lodges. Food Court with 10000 sft A2B Adyar Anadha Bhavan is open and a Banquet Hall shortly. Krishnas in Dhanunjaya hotel﻿, Arusuvai, Sangeet Sagar, Hotel Vasanth vihar, Nilgiris, Anand Bhavan, Arul Bhavan, Meenakshi Bhavan, , Sri Saravana Bhavan Homely Karnataka style – Vasavi Café & Anjaneya Vilas mess are some of the excellent vegetarian hotels. Pepper Mint, Tandooriwala, Ambur Star Briyani in Maruthi Nagar, Janani, Nandhini , Junior Kuppanna, Sampoorna, Mundasukatti, Namma Veedu, VS Hotels, Sun, AP Biriyani Hotel, RK Dhaba in Attibelle are the leading Non Vegetarian Multi cuisine restaurants. If u want to experience something different u can try in Andhra mess in Basthi, Five star petrol bunk Hotel, National petrol bunk hotel, Gani hotel, Selvam Mess, Ganesh bhavan in bagalur hudco for kerala style Parotta and Punjabi dhaba in JR petrol bunk in Perandapalli. Leading Chain Hotels - A2B -Adyar Anandha Bhavan 20 km., Saravan Bhavan, from Hosur on Krishnagiri highway, Krishnas, Cafe Coffee Day, Mc Donalds, KFC at 15 th km towards Electronic city, Dhaabha Express at 12 th k.m, Hotel Kamat at 10 th. k.m, La classic 3 star, R.K.Dhabha in Attibelle with Bar, Ramee Guestline at Attibelle and Gangothri are the places were you can enjoy high quality food, snacks and sweets. Konica computerized color lab is in tank street and another on GH road. Raghavendra, Sri Ram fancy and stationery in bus stand , Ganesh paper mart, Ganapathi paper , Babu stores in Nethaji road are famous shops for All stationery and books. Super Markets - Big Bazaar, Chennai Super Bazaar, Nilgiris, Pallavi, Pushpa, Jyothi , Colombo , Dhanam, Kingson, Rukmini are some of the best shops who also supply to your doorstep. Now a big Supermarket in 30000 sq.ft. is under construction adjoining Chennai Silks. Pooja articles and flowers on the Taluk office road. Crackers are available in plenty and the most competitive in Tamilnadu, cheaper than Karnataka. Ulavar santhai in Taluk office road and Basthi is famous for fresh vegetable and fruits at farmers rate – 6 am to 11 am. Good fruits are available in Old Busstand opp. Hotel Gowrishankar., near Parimalam school., Pallavi fresh, Pazhamudir nilayam and in ulavar sandhai. Fish, mutton are fresh in Taluk office road and Opp. CSI church. Chicken opp. Busstand. , ring road, A Frozen food outlet Kutty's VEG and NON VEG is available behind RTO office in Mathigiri Circle. Hosur is famous for locally made silk sarees. TPSOH The Peoples Society of Hosur , 7 Rotary clubs , Round table, 4 Lions club, Madras Management Association, JC's, Y’s men club are here. Vathsalyam, Bala Gokulam and Saradeshwaram (M: 9442526598) in Denkani kotta, Annai Saradha Orphange and Swami Vivekanandha Orphanage is in Mathigiri. Narendra Nambikkai, Saradheshwaram, Abala -Home for Destitute women in Bagalur road opp. Samathuvapuram. Chandra choodeswara Hill temple, Perumal temple, Bhandari Anjaneya temple, Kottai mariamman, Agaram Bala Murugan temple, Venkataramana swamy temple at Gopachandiram near reliance petrol bunk on NH7, Gopalaswamy temple in Gokul nagar are famous age old temples. Denkanikotta is famous for Numerous Narasimma Swamy Cave temples. Bhaktha Anjaneya temple in Maruthi Nagar., Kalyana Venkateshwara swamy and Sai Baba temple in Gokul nagar, Ayyapan temple near Kamaraj colony, Ragavendra temple in Rayakotah road, Saibaba temple behind SBS hospital, Om shakthi temple opp. GH. R.C. and CSI church near railway station and Dharga, Luteran church in Nethaji road,. Pentecostal in Telephone exchange road, Mosque in Nethaji road , MG road, Bathlapalli, Dharga, Bagalur road, Mathigiri. Hosur Schools - All schools have excellent campus and lab facilities and well organized transport . State Board and Matriculation – Litera Valley Matriculation school, Maharishi, Parimalam, St Joseph, Vijay vidyalaya, TVS school. TITAN school, Seventh day, Swathy, Velankanni matriculation, Greenvalley, CSI, Guru, Carmel International, and N number of schools. St.Peters Medical College and University, Adhiyaman college of Arts, science and Engineering., MBA, polytechnic, Teacher training, Para medical in a 250 acre campus with excellent hostel, transport, lab and faculty. PMC Engineering college, ITI polytechnic, Govt Arts College, St.Josephs Womens college, St.Joseph I.T.I , Government I.T.I are here. Numerous banks of about 25 in no., with one or more branches . Both Multi national and all state branches,100 plus ATM’s, Lockers are available. Theatres – Raghavendra, Manjunatha A/c, Lakshmi Devi, Srinivasa, Balaji are some of the theatres which release Tamil, Telugu and Kannada. Now a days all are well maintained. 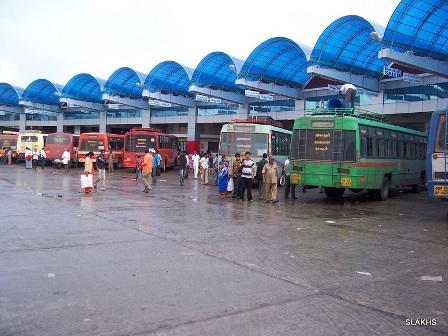 Transport - KPN, ABT, SRM, Sharma, Shaama, KSRTC, TNSTC, SRS are the Deluxe Omni Busses well connected with more than 30 destinations. Railways- Well connected to Bangalore, North India, Madurai, Nellai, Trichy, Kerala. Weekends - Visit Hogenakkal , Yelagiri, Yercaud, Nandhi Hills, Denkanikotta Rock cut caves, Bhandipur, Bannerghatta, JLR at Masinangudi.